Reception for participants and Webb AFB exes that evening. Reunion and Dance Saturday evening. There are three things to remember when producing an air show----coordination, coordination, coordination.... or was it work, work, work? Big Spring is a relatively small town of about 20,000 so we had to count on drawing people from other West Texas towns in order to even hope to raise any money. 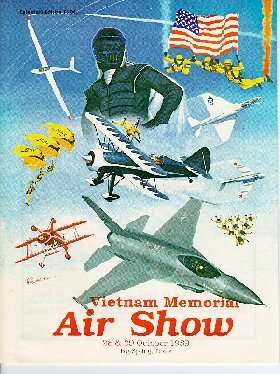 As the schedule indicates, our first air show was a pretty simple one. We utilized mostly local West Texas talent with minimal military participation. The second air show required much greater coordination and much more work. Before the first air show had even ended we were working on the second. By the time the third air show rolled around we had had at least one person working on a air show related project for over three years. It was hard work, but when the crowds start pouring in the gates, and the planes start flying....the feeling was great! Our air show committee consisted of hard working people who all had a good track record in the community for getting things done. We tried to ensure we had a diverse group. We gathered as much community support as possible. 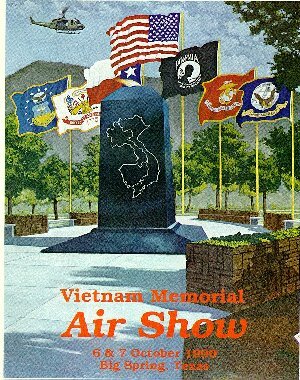 Our goal being to raise money for a Vietnam memorial made it much easier to get support. We enlisted the local Chamber of Commerce and the city and county government....these added credibility. All major businesses were approached for sponsorship's.....in return they received exposure for their company and first class seating at the air shows. In order to receive any military participation, including Air Guard units, approval from the Pentagon was required. A "Request for Military Aerial Support" (DD Form 2535) had to be completed (these are available from any Air Force Base or Air Guard unit). Approvals were required from the airport manager (or agent exercising authority for the site), the FAA Flight Standards District Office, and the DOD OASD (PA) DCR (Aviation Liaison Officer). The completed form had to be received by DOD no later then October 1 of the previous year for any requests for the Golden Knights, Blue Angels, and the Thunderbirds. A simple fly-by required a 90 day lead time. Aside from DOD approval for the Golden Knights, Blue Angels, and the Thunderbirds, the approval for aerial support didn't guarantee what we could get. We had to contact every military base in the Southwest to see what was available on our target weekend. One of the things that made our second and third air shows successful was the ease of which it was to get military support on the unit level. We took great care of the pilots...and word got around. We ensured they were treated like visiting royalty. Upon arrival, each aviator was greeted with a food and drink buffet set up in our operations building and given air show hats and other memorabilia. Aside from the basic requirements for transportation to and from the venue, lodging and meals the pilots liked to party. town at sunrise. One year we had a B1-B do the buzzing the day before. lodging for the military; and the above mentioned insurance. 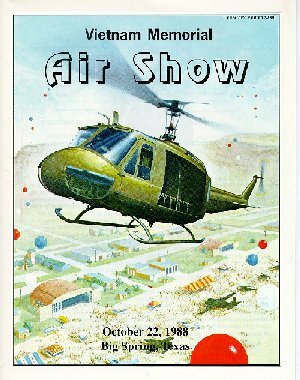 The 1989 air show cost us over $53,000, and we grossed $78,000...which we thought was pretty good for a bunch of amateurs.After three years and three airshows we were all tired....and haven't had a air show since 990. Even though the money was for a worthy cause, what was probably more important than the money, was the awareness that was raised. People remembered Vietnam and our POW/MIAs, and they looked at Vietnam veterans in a little better light.